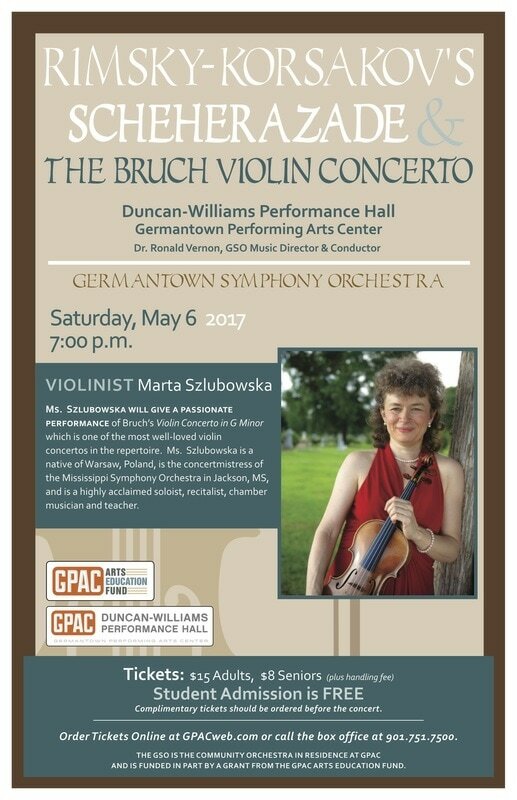 Saturday, May 6, 2017, 7:00 p.m.
​Violinist Marta Szlubowska is the Concertmistress of the Mississippi Symphony Orchestra in Jackson, MS, the position she has held since 2004. She is also a highly acclaimed soloist, recitalist, chamber musician and a teacher. A native of Warsaw, Poland, Ms. Szlubowska gave her first public performance at the age of seven at the Warsaw Philharmonic Hall. At thirteen, she was chosen to represent Poland on a tour to Great Britain, performing as a soloist with the Szymanowski Liceum Orchestra. In 1983 Ms. Szlubowska came to the United States to study at the Peabody Conservatory of Music as a winner of the Joseph Maddy Scholarship, where she received Bachelor of Music Degree in Performance and an Artist's Diploma. She continued with a second graduate degree at the University of Massachusetts at Amherst, earning her Master's of Music in Violin Performance as a teaching assistant of the world-renowned concert violinist, Charles Treger. Ms. Szlubowska's other distinguished teachers included Janusz Szok, Charles Libove and Berl Senofsky. Ms. Szlubowska has been awarded many prizes including first prize in the Yale Gordon International Concerto Competition and the Murbury Concerto Competition in Baltimore, MD. She has won the second prize at the Bryan International String Competition in North Carolina, as well as the Honorable Mentions at the Wieniawski International Violin Competition in Poland, Queen Elizabeth Competition in Belgium and the Sibelius International Violin Competition in Finland.In the U.S., Ms. Szlubowska has appeared as a soloist with the Mississippi Symphony, North Carolina Symphony, Germantown Symphony, Olympia Symphony, Tacoma Symphony, Bellevue Philharmonic, Beyond the South Chamber Orchestra and many others. Ms. Szlubowska has given numerous performances at the Tanglewood, Interlochen and Meadowmount Music Festivals as well as the Colorado Music Festival and the Vermont Mozart Festival. She has served on the faculty of the Eastern Music Festival, Marrowstone Music Festival, Belvedere Chamber Music Festival, and Utah Music Festival. She has performed under the baton of Leonard Bernstein and Seiji Ozawa at Tanglewood, and Alexander Schneider at Carnegie Hall and the Kennedy Center for the Performing Arts in Washington, DC. She has appeared at the prestigious Phillips Collection in Washington, DC and the Community Concerts, Inc. in California. Ms. Szlubowska has collaborated with such distinguished artists as Judith Glyde, Kevin Kenner, Julius Baker, Gerhardt Zimmerman, Harvey Felder, Alex Klein and many others. She has performed in masterclasses for such world-renowned violinists as Ruggiero Ricci, Henryk Szeryng, Martin Chalifour, Burton Kaplan, Aaron Rosand and many others. 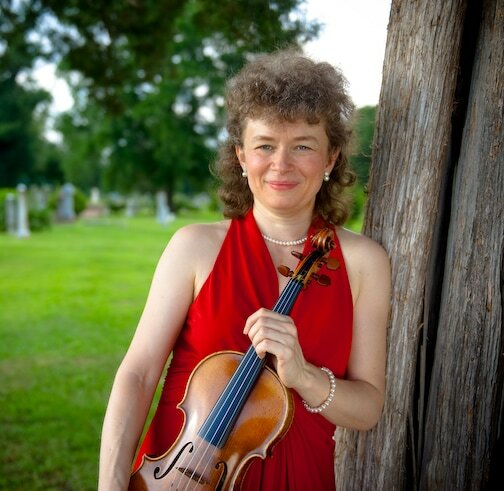 Between 1992 and 1999 Ms. Szlubowska held the position of Assistant Professor of Violin at Pacific Lutheran University in Tacoma, Washington, where in addition to teaching, she was the First Violinist of the Regency String Quartet. Between 1998-2004 Ms. Szlubowska held the position of Concertmistress of the Tacoma Symphony and later the La Crosse Symphony Orchestra and was invited to perform numerous concerts with Minnesota Orchestra under the direction of such renowned conductors as Edo de Waart and Stanislaw Skrowaczewski. In June of 2009 Ms. Szlubowska toured Hungary, Austria and Czech Republic performing as a soloist and as part of the Duo Vivace (two violins) with her daughter, Julia Kirk. Since 2009 Ms. Szlubowska has performed and given many master classes in Columbia, Peru and Chile. While performing and teaching in South America, Ms. Szlubowska has been a part of a special project that brings talented young musicians to the U.S. in order for them to receive the education and opportunities they deserve.